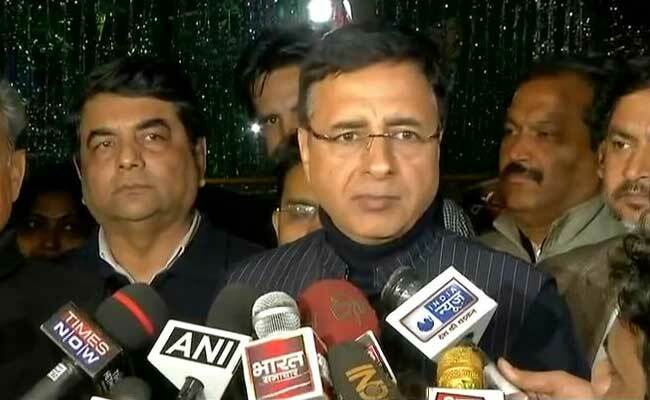 Randeep Surjewala said the Congress has always maintained that there can be no political viewpoints on Doklam and the sole criteria needs to be "national interest", which needs to protected at all costs. New Delhi: The Congress on Thursday accused Prime Minister Narendra Modi of compromising with national security and strategic interests, and said his government was "caught snoozing" when China was reportedly occupying the Doklam plateau with fresh military installations. "India's national security and strategic interests are being compromised with as is now apparent from satellite imagery as also media reports available in public domain. It is most unfortunate that the Modi government has been caught snoozing while the Chinese have occupied the Doklam plateau as per news reports and satellite imagery and a planning a repeat of Doklam 2 type of face-off," Congress communications in-charge Randeep Surjewala told reporters. Training his guns on the prime minister, he said, "Modi Ji, who has mastered the art of electoral rhetoric, has miserably failed to ensure full protection of our borders." Mr Surjewala said the Congress has always maintained that there can be no political viewpoints on Doklam and the sole criteria needs to be "national interest", which needs to protected at all costs. "But listless attitude of the Modi government has forced us to doubt its actions...," he said. The satellite imagery, he said, indicates a high degree of Chinese military build-up at the Doklam plateau, just a few metres away from the Indian Army post. "The BJP is so consumed in headlines management, false bravado, self-promotion that it has conveniently forgotten that serious issues of national security, exist! It seems that the Modi government is living in a make belief cuckoo world of TV studio warfare, superbly engrossed in loudmouth rhetoric by hired commentators that for them the line between 'virtual' and 'real' has completely vanished!" he said. He asked the BJP government to apprise the countrymen on reports and latest satellite imagery suggesting that Chinese Army has not only built full-fledged military complex in Doklam, but has already occupied the entire Doklam plateau right up to 10 metres from the Indian Army post. "Is the Modi Government, especially the Defence Ministry, aware of this presence?" he asked. Quoting the external affairs ministry's statement of August 28, 2017, wherein it said both India and China had agreed on "expeditious disengagement of border personnel at the face-off site at Doklam" and it "is on-going", he asked "Is this new buildup of Doklam 2.0 by the Chinese an implementation of its stand?" The Congress leader said that in the run-up to the 2014 Lok Sabha elections, PM Modi had made several insinuations on the Congress party and spoken about showing "Laal Aankh" (angry look) to China. "But, now the number of face-offs with the Chinese on the LAC has shot up by 48 per cent last year. There were 415 transgressions by Chinese soldiers into the Indian side of the LAC in 2017 - as against 271 transgressions in 2016. What does it say about Modi's empty rhetoric in election rallies? What steps has the Modi government taken to prevent these intrusions?" he asked.